Men’s football performance programme manager Hall took 21 players and five staff members to Salou for a warm weather training camp. This was the third successive year Worthing College have conducted the tour. The four day trip consisted of two games - against Technifutbol Academy and Costa Daurada - in which Hall’s team maintained their unbeaten record on European soil. A wide range of training sessions, some conducted by top Spanish coaches, as well as others by College staff members. It was all rounded off with a tour of Barcelona’s iconic Camp Nou Stadium. During Worthing College’s tour, professional teams including Chinese club Green Town, lower league German outfit FC Rielasingen-Arlen and youth teams from Toronto FC were also making use of the Salou facilities. And the chance to see how full-time teams went about training was something Hall feels students will only benefit from. “The aim of these training camps is to provide students with the opportunity to train like professional players for an intense period and at the same time compete against foreign opposition, which is a very educational experience.,” Hall said. “This can only stand them in good stead for the future. “The players must take credit for the levels of performance being consistent throughout both matches played and continuing our form being unbeaten in Europe for three years. “Training was extremely positive and the players put in a great amount of effort and it’s great to see so many first year students really step up, which will enhance their remaining performances for the rest of the season. As Worthing College squads head into the business end of the season with teams still involved in league and cup competition, the tour provided a great experience and chance to further develop. 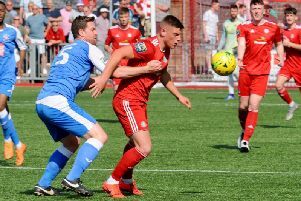 The students quickly got to work and a hat-trick for Elliot Bennett fired Worthing to a 4-1 win over Technifutbol on the opening day of the tour. A masterclass training session, led by highly qualified Spanish coaches, took place the following morning before a game with local side Costa Daurada saw Worthing pick up a draw later in the day. The group were then put through their paces, testing their strength and conditioning. Arrangements for the afternoon were a little lighter but across the three days students were pushed hard but will have taken plenty from the experience. Across the four days various professional teams from around the world were also present and made use of the facilities.